These 7 mixes each contain 5-6 superfoods as nutritious as fresh ingredients, but way more convenient. Umpteen. That's how many servings of fruits and veggies we need every day. 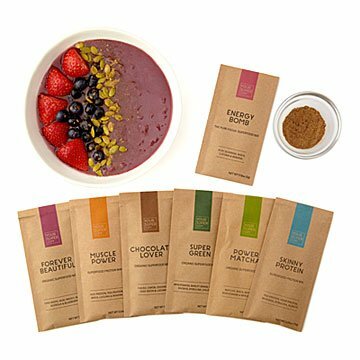 These seven unique superfood mixes make it easy: just add one spoonful to smoothies, breakfasts, and snacks. Voila! The nutritional power of fresh, whole foods and the convenience of supplements. Each is made up of 5-6 organic, nutrient-dense ingredients used for thousands of years by indigenous cultures, blended by nutritionists into functional mixes. Chocolate Lover is designed to boost moods, Forever Beautiful to nourish your skin, Muscle Power for post-workout recovery, etc. Add them to anything, even desserts—there are umpteen-eleventy ways to use them. Vegan and gluten-free. Sourced globally, made in Germany.